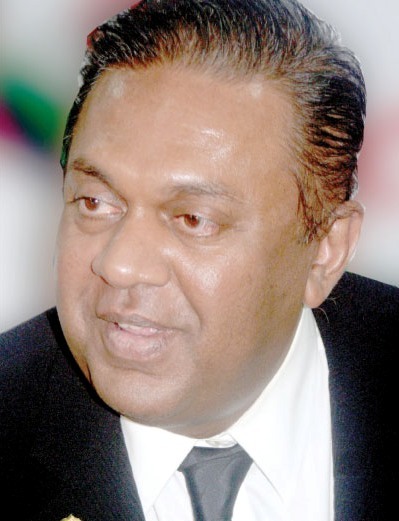 “According to some of the people we’ve been working with, they feel that the assets that have been siphoned off from this country by the Rajapaksa family at large may amount to 18 billion dollars” says the Minister of Foreign Affairs, Mangala Samaraweera. “In fact, we have done a little better than the Libyans and the others because at least we know where 2 billion is, but it is not an easy task and we are getting help and support to negotiate and get access to these funds.” Samaraweera further said. 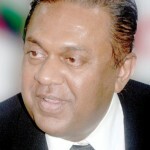 Minster Samaraweera made above remarks today at Siri Kotha. 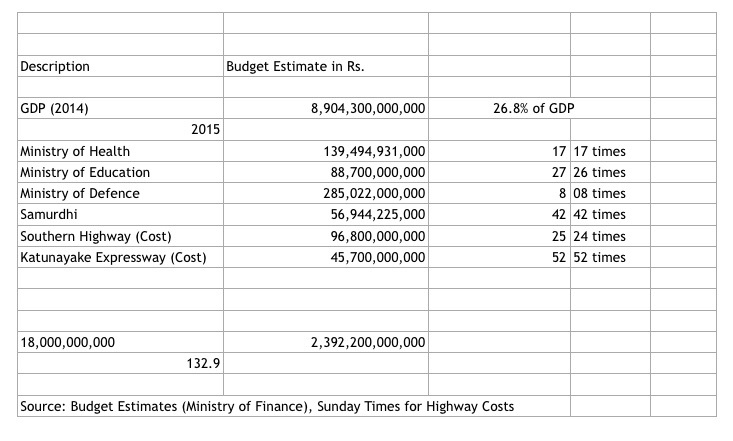 The spreadsheet below compares the budgets of several key ministries to the sum of stolen assets. Notably, 18 billion is equal to the annual Samurdhi budget X 42 i.e. its equal to 42 times the Samurdhi budget. Domestic mechanism timeline: “We do have a timeline (for the domestic accountability mechanism). We are working according to a timeline even now. I think we will be able to meet the timeline. All I can say is that, we will have a domestic accountability mechanism in place in time when the 30th Sessions commence in September. And the OISL report that will be tabled can be referred to the Sir Lankan mechanism. They have not given us any kind of requirements, but it is our duty. This is a promise we have made to the people of this country, and we want to stick to the timeline as much as possible. Ukraine arms: we are organizing a team of people, two police officers and one official from the Ministry to go to the Ukraine, I got the Ambassador who is now in Delhi to come down about two weeks ago. He is now arranging for them to go to the Ukraine. He said any dates after the 9th which is the end of this week and once all the appointments are complete especially with the public prosecutor of the Ukraine who is I believe is aware of this deal. Moment those appointments are through will go through. (Inaudible) I have to report to Parliament when its done, lets wait till the report is out. We have now suddenly received the heavy luggage of Mr Udayanga Weeratunga to the foreign ministry. He has sent various people to collect it without any power of attorney. We have not released it. Then I beleive last week he appeared in Tehran out of all places and gone to the embassy and requested his luggage to be released. But now we have informed the investigators and the police and we are getting their advice with what to do with the luggage. The luggage is here in Colombo. There is no warrant for his arrest. Its far too early, until investigations. Obviously his guilt his making him hide, he has become an international fugitive. This is the caliber of our former ambassadors.